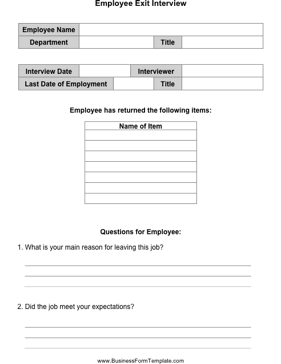 This form asks standard questions of a departing employee, whether that employee has quit or been fired. 1. What is your main reason for leaving this job? 2. Did the job meet your expectations? 3. Did you receive adequate support in your job? 4. Were you satisfied with the company's review process? 5. What would you do to improve the work environment? 6. Would you consider working here again? 7. Were you paid a salary commensurate with your duties? 8. What did you like most about the company? 9. What did you like least about the company? 10. Did you find the work to be rewarding? 11. What do you expect a new job to offer that this one doesn't?